Accept payments via UPI without asking your customer to enter any bank details, OTPs and password. 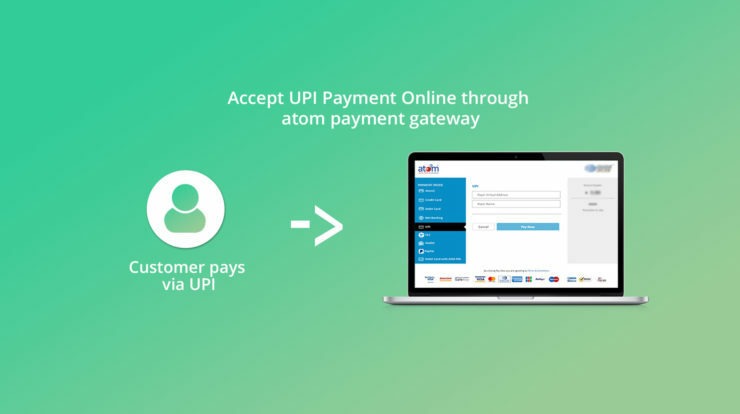 Yes, it’s that easy to accept UPI payment online through atom payment gateway. Your customers can use any UPI enabled app to make payments directly on your website. Often, your customers are bogged down by the burden of remembering bank credentials and its complexities. But what if you provide them with an option so, that they don’t have to remember any such details to pay online? Merchant– O really! Is that possible? atom: Yes, with UPI. UPI is a unified payment system that allows you to accept money from your customers, without asking them to feed any bank details. Merchant– So, if we are not asking for any bank details then, how does the transaction occur? atom: Every UPI user have an address called the VPA (Virtual Payment Address) and the address is linked to mobile number and account number. So, your customer can directly use the VPA for doing transactions. Merchant- How do customers get a VPA? atom-: VPA can be created from an UPI enabled bank mobile application or third party application. They only need to share the VPA to make payments. Merchant– what will be the flow of transaction? atom– when customer select the UPI option to pay online, they need to fill in their VPA to initiate payment request. Post verification of VPA, they receive payment request in their UPI enabled app. They accept the request and enter the MPIN and payment is done. Merchant: That’s interesting. UPI payment mode will definitely help me to increase my sales as it’s a very convenient payment option. Best success rates – All calls are server to server and therefore, no redirects, hence it gives the best success rates. Secure transactions – RBI approved single click and 2 factor authentication. Customer’s mobile is the First factor and M-Pin is Second factor authentication. M-Pin is Mobile PIN which is created while linking a bank account with a VPA handle. One app for all Banks – If you have multiple banks, you can still do all your transactions from a single app. Unlimited transaction – UPI payment is the best payment method for your customers if they want to make large amount of transaction daily. However, the upper limit is 1 lakh per day. Easy and safe payments – Your customer just needs to enter MPIN to process the payment. There’s no need to enter any OTP’s or passwords. Hence, easy and secure payments are possible on UPI enabled apps. By far, UPI has turned out to be the best payment mode as it saves us from the hassles of feeding any kind of bank details. What is Mobile POS, How it works and why does your business need it ? How to use mGalla- Payment App for Merchants ?